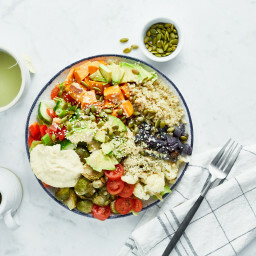 Ask Angela: Favourite uses for hemp hearts, make-ahead lentil loaf tips, my go-to wrap, and more! 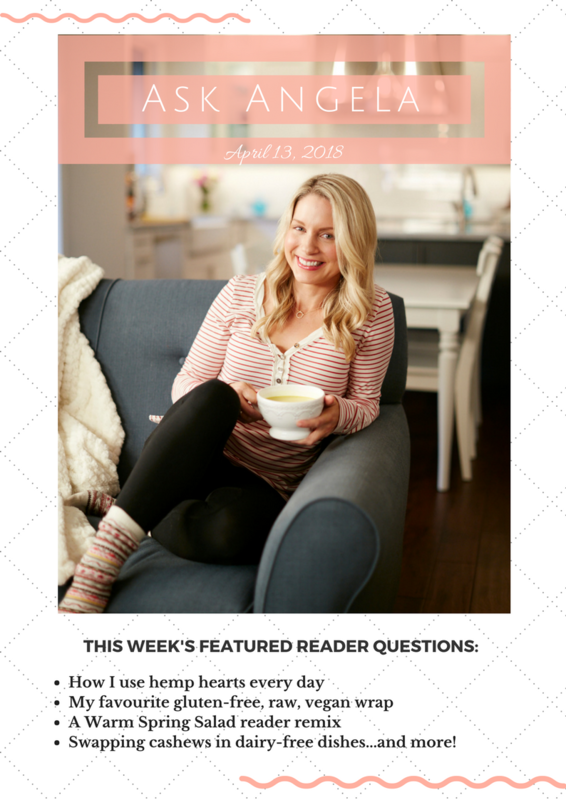 Without further ado, here are this week’s featured reader questions…it’s a great batch, and I’m loving the Comment of the Week by Kristen, too! Lots of great meal planning ideas in there. Q1. 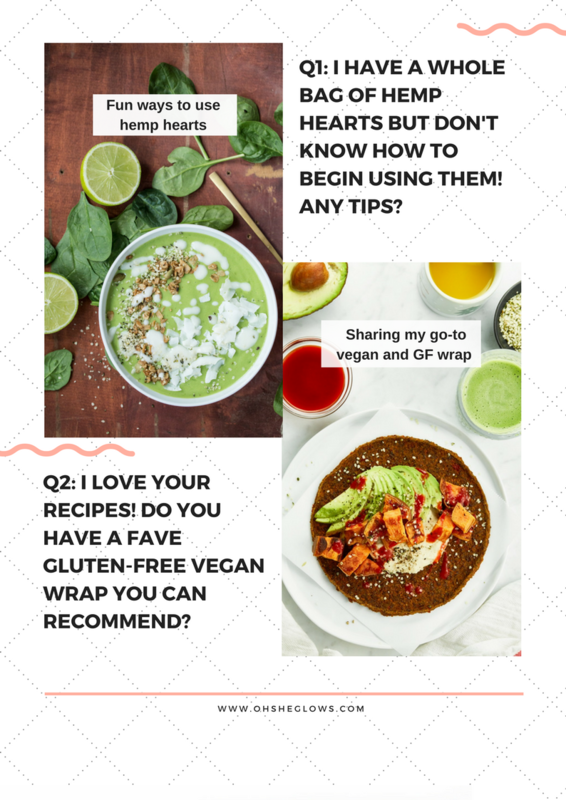 Do you have any tips for using hemp hearts? I have a big unopened bag of them in the cupboard and don’t know where to start! Thank you! I love this question because we’re big fans of hemp hearts in our house! I love to add them to smoothies and energy ball/granola bar recipes, chia seed pudding or overnight oats (either mixed in or sprinkled on top), stirred into pasta for a protein boost, sprinkled on avocado toast, or blended into nut/seed milks and salad dressings—but the possibilities are endless…they’re so versatile! If you’d like to use my recipes as a guide, searching “hemp hearts” in the search bar will lead you to any OSG recipes calling for them. I’d love to hear what you make with them! Q2. Hi Angela, thanks so much for all your wonderful recipes. I haven’t found one I don’t like yet. I do have a question though: I am gluten-free and haven’t found a good, gluten-free, vegan wrap that does not fall apart when you try to roll it. Do you have any suggestions? Thanks again. Hey Silvia, Thank you for the kind words! My go-to raw flax wraps are made by Wrap It Up Raw. They’re delicious and hold together amazingly. You can find out where they’re sold on Wrap It Up Raw’s store locator page (exciting news…Metro Ontario just started carrying them!). Hope this helps! Q3. 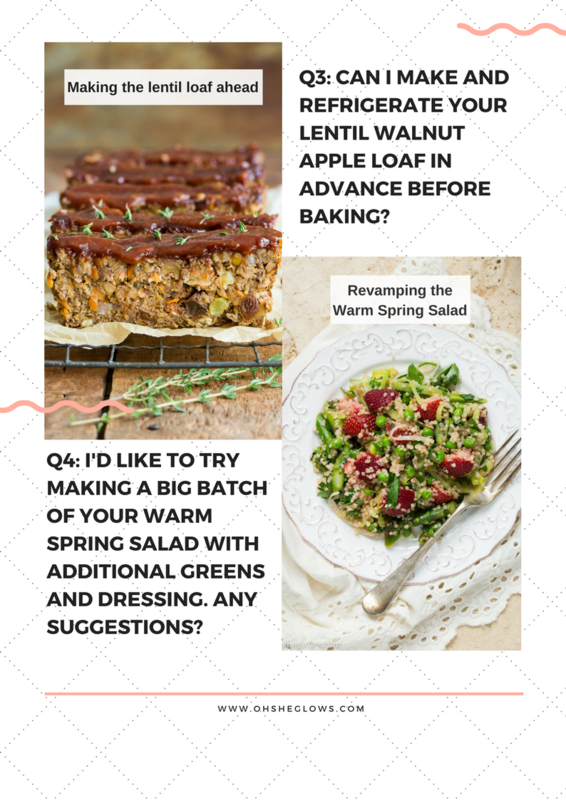 Can I prep your Lentil Walnut Apple Loaf in advance and refrigerate it for baking the next day? Hey Roz, Yes, you can absolutely prep the loaf a day in advance and refrigerate until you’re ready to bake—just be sure to wrap the loaf pan tightly before refrigerating so it doesn’t dry out. If the loaf is going into the oven cold (straight from the fridge), you’ll likely need to cook it for a bit longer than called for…maybe 5 to 10 minutes more. Alternatively, you can bring the loaf to room temperature first and then bake as directed. Hey Sara, I love your idea of adding greens and extra dressing…I honestly think that would be amazing. Butter lettuce sounds delightfully crunchy, but I think almost any variety should be fine. If you decide to go with a lettuce that wilts quickly (such as a delicate spring mix) I would opt to add it just before serving. Heartier veggies like kale or shaved brussels should be fine added in advance. Also, I’m not sure if you’ve tried this Make-Ahead Thanksgiving Panzanella recipe yet, but it’s to die for…and from the sounds of your comment, might be right up your alley! Q5. Hi Angela, I am about to make your Cozy Butternut and Sweet Potato Red Lentil Stew. Really looking forward to trying it…yum! It’s great to hear another reader has tried the recipe without tomatoes, too. I have a question about upping the quantities. I need to make the stew for 13+ people, and I see your recipe yields 11 cups (2.75 quarts). I am English and a little unfamiliar with measuring in quarts. Do you have any tips for making enough Cozy Stew to feed my guests? Hey Georgie, Happy to help! Eleven cups is also equal to 2.6 litres…I’m not sure if this info helps at all? So, if you’re making the stew for 13 people, I think you’d probably want to double the recipe, if not triple it. I estimate that this recipe (as written) serves 6 as a starter (at just under 2 cups/500 mL per person), but if you’re serving the stew as a main, I think 4 servings may be a safer estimate. Doubling soup recipes can be a bit tricky as sometimes you don’t need to fully double the liquid, and sometimes you need to use less salt, too…so my advice would be to add the liquid and salt slowly as it cooks, to your taste. I’d love to hear how it goes! Q6. 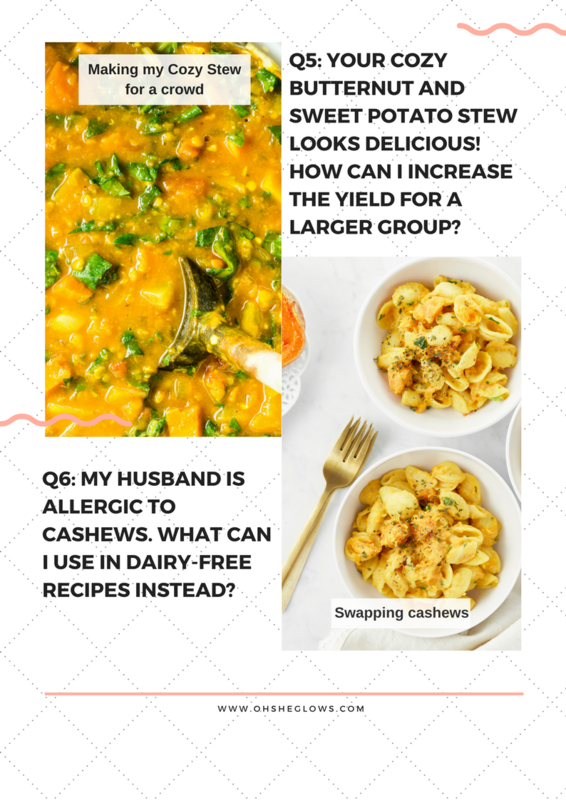 I’m trying to use less cheese and dairy at home, but I find that so many non-dairy recipes call for cashews or cashew cream instead. My husband is allergic to cashews so that isn’t an option for us. Is there a universal swap for cashews in dairy replacements, or does it depend on the recipe? 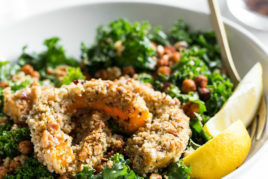 I’d love to make your All-Purpose Vegan Cheese Sauce and other vegan recipes, but have been struggling to figure out how to replace the cashews. Thank you! Hey Valerie, A cashew allergy can make swapping tricky for sure, but don’t despair as it can be done! I’d say it depends on the recipe, but I’m happy to help you troubleshoot if you have any specific ones in mind. If you leave a comment with the recipes you’d like to make first I can reply with my substitution ideas (it’s fun brainstorming for me…I’m kind of a nerd like that). Sometimes you can swap raw cashews for raw sunflower seeds, such as in my All-Purpose Vegan Cheese Sauce recipe (see the tip for the deets!). I’ve also heard you can use macadamia nuts as an alternative to cashews in some recipes, but I haven’t tried it yet. Hey Kristen, WOW, you’re on fire! Thank you for sharing all of your meal ideas…I always find it so inspiring when readers mention what they’re making, and comments like yours never fail to make me remember those forgotten recipes of OSG’s past! And I love that you make the loaded nachos for dinner…we do that too from time to time and it’s always a hit. Thank you for all of your support and kind words! 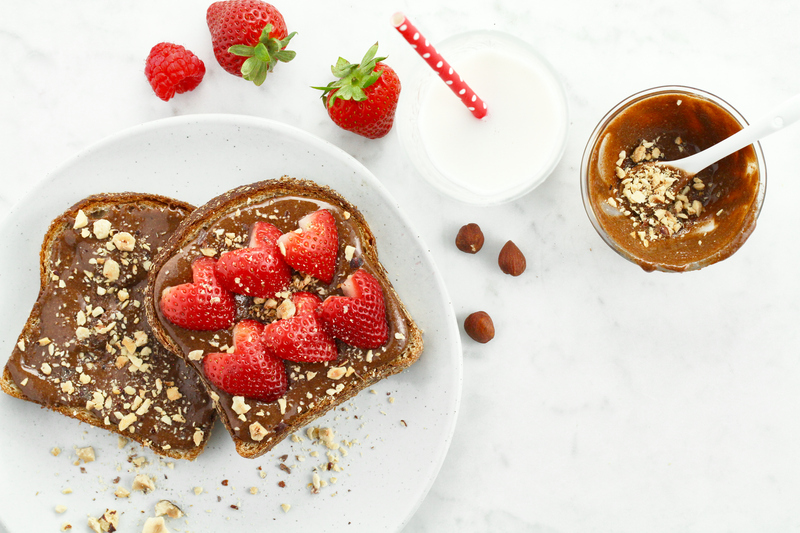 Just a quick note that I added a revamp of my Homemade Mocha Nutella to the app…and wowza it’s good. Also, the iOS version of our app is still on sale for 99 cents (for the next several days) if you want to take advantage! Hey Kristen, I’m so glad you saw the COTW! I really appreciate you taking the time to share all your recipe ideas with everyone. And of course, SO flattered that you make and enjoy so many! Thanks again. Ps. I also loooove the raw flax wraps by Wrap it Up! I often use them as a healthier base for homemade pizza night at my place. They take a bit longer to bake, but definitely worth the wait. Happy weekend! My boyfriend is (definitely) not a vegetarian, but so far all your recipes have been a big hit here at our house! So thank you so much for sharing your amazing recipes! Have a good weekend! Thank you so much Catherine! I’m so grateful for your kind words and support. It really means the world to us that you love the app so much too! It’s been such a fun project to work on. I wanted to let you know that I have your two books and they have become staples in our household, as well as many recipes on your blog. We are avid hikers and my boyfriend and his son ALWAYS insist I make your Glo Bars for our treks. On another note, last week I had a whole bunch of girls over for a facial/spa session and I wanted to make sure we had healthy bites on hand as snacks. I ended up making and serving your Triple Almond Energy Balls, the Vegan Chocolate Macaroon Truffles, the Vegan Eggnogg Crunch Biscotti and your Smoky & Spicy Nut, Sesame and Coconut Bacon Bar nuts. Needless to say they were all a big hit with my friends and they all asked for the link to the recipes on your website. I would love to send you a picture but I can’t copy/paste into the comment box. If you leave me an email, I can send it to you! Thank you again for your inspirational recipes, I love your blog and I love your recipe books. Hey Caroline, Aww thank you so much for your lovely note!! Totally made my day. I love that you made so many recipes for the spa session…sounds like the perfect day. Oh and I’d love to see a picture you can email it to press[at]ohsheglows[dot]com. Thanks Caroline! Angela…you are awesome! And again I thank you! And my husband Harry just said how gorgeous your photography and incredible your app is (And he is a photographer and majored in photojournalism, psychology, teaching, and has an MBA, although he currently teaches AP Psychology now) !!! And he reminded me about how much he loves your Hunky Heartbeet cabbage soup! I make a batch and freeze individual servings and he took one for lunch! The people at lunch went so crazy over it..and asked for the recipe …so he shared that it is YOU!!! And directed them to you , your site, and app! Hey Kristen, WOW I am feeling the LOVE over here!!! hehe. Thank you both so much. I’m so flattered! I really appreciate you and your husband spreading the word about my recipes too. Big hugs! Thank you so much for this post! As someone who recently gave up dairy and meat, I find this information so helpful! Great work on the blog! I really appreciate reading your posts every week. Hey Nikki, I’m so happy to hear you enjoy them…thank you! And good luck with your meat/dairy-free journey..I hope you find a lot of delicious recipes to make here. Hi Angela and all. Wondering if you or anyone out there can recommend a decent sub for vanilla. It’s so darned expensive these days! I usually make my own, but even the beans are pricey. I’ve read about maple syrup being a substitute, and then there’s the idea of making vanilla sugar, but I also read that bourbon could be used. I’ve never tasted bourbon, so I’m not sure. Has anyone tried it? Or any other ideas? Thanks to everyone for your help! I absolutely love your recipes. They are natural, healthy, and usually involve simple ingredients that I already have in my pantry. I have both cookbooks, the app, and I go on your website often for food inspiration. I base my meal planning around your cookbooks because they are so fail proof! I was wondering, have you ever thought about developing a meal planning app with all your recipes in it? Or do you have any tips on meal planning and weekend food prep for busy people ? 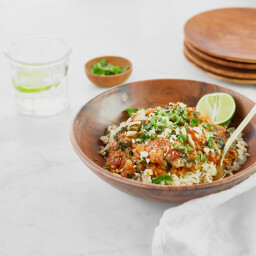 Hey Mya, Thank you so much for the recipe love…that’s so cool you have the cookbooks and app. I appreciate your support so much! Swapping liquid sweetener in nut butters can be tricky, I’ve found. Sometimes the liquid sweetener can cause the nut butter to seize (thicken and get clumpy) which is why I like to use powdered coconut sugar in the Nutella. You might be able to get away with 1-2 (room temperature) tablespoons of liquid sweetener, but I’m really not sure to be honest! I’m so sorry I can’t give you a more concrete answer. If you try anything I’d love to hear how it goes. Hahaha it went terribly!! It was just like you said; it seized up and the whole thing was a disgusting mess! The oil separated and the rest is as hard as a brick and inedible lol. I think I need to buy a new Vitamix container because it’s baked in and I can’t get it out :/ (I switched to the Vitamix when my processor wasn’t handling it.) Word to the wise everyone haha. Oh shoot, that’s such a bummer. Sounds like you had one of those days in the kitchen (I’ve had those too….never fun). I hope after some soaking your container bounces back. Did you try the warm water and soap blending trick…if not, try that as it could help loosen it from the container. Hugs! Thank you! I’ll try that! :) the brick has just been sitting on my counter haha. I put hemp hearts in almost everything I eat, sweet and savory alike! Today, I’ve sprinkled hearts on a sprout salad, hummus, curried vegetables, pineapple, yogurt, a smoothie, avocado toast…. such a versatile protein hit! Great write-up. A note on replacing cashews with macadamia nuts – I do this pretty often and it works well! I’ve made macadamia cream and a soft macadamia cheese. Not sure how it would go in something like a raw cheesecake though. Definitely for cream, milk, baking – totally fine. Hey Ella, Oh thanks so much for weighing in! So awesome it has worked for you in cream sauces as that’s one thing I wanted to try soon :) yum. And can you imagine a macadamia cheese cake?! I became vegetarian was I was 11 and had such a tough time maintaining a healthy diet that was mostly plant-based (no dairy).. I was sick, iron & b12 deficient… anyhow, my poor mother did everything to keep me healthy and with time I became very healthy with this diet! It was just a huge learning curve for me and my family as the only veg! Your blog has made my life so much easier finding new recipes. Twenty years ago, there weren’t so many blogs but now with all the info out there, sometimes it is more overwhelming than anything. What is your take on nutrient-dense powders and supplements? Such as Spirulina, Chlorella, Lucuma, etc. I like Chlorella for the b12 content, it helped me cut out b12 pills on a daily basis. But other than that, do you think they are necessary? Thanks so much – and please keep doing what you do! And congrats on your awards!!! Very well deserved!! I don’t know if it’s just me, or the brand I get – but I find that hemp seeds have a decidedly herby, savory flavor profile to them, so I find they throw off sweet recipes, like smoothies, granolas, etc. Are they supposed taste more neutral like flax or chia? I get mine from a bulk section at my local organic grocer. Really – they have a taste reminiscent of oregano or cumin. Definitely not something I want in my smoothies. I’ll sprinkle them on salads and bake into savory dishes with no problem. Well, I learned something new today! I didn’t know what hemp hearts are. Dohhh. What kind of vegan do I think I am?? (Well, not a very good cook, that’s true…) I had tried hemp powder in smoothies, but didn’t make the connection that hemp hearts are the seeds. And, I’m like Kelly – the Earthy flavor was a bit of a conflict for me with fruit, so I stopped eating it altogether. But I love the idea of mixing it with non-sweet recipes. Makes sense! Will try it. I’m a big fan of your site and your cookbooks. Thank you for all the ideas and putting good energy into the world! haha love your comment Kristen ;) I hope you like it in savoury things…it’s good in vegan “parmesan” and pesto! Aww thank you so much for the kind words! :) The wrap is in the “Get Glowing” bundle on the bundles page. If you’ve recently reinstalled the app you may need to download it again. Please shoot me a line if you can’t get it and I’ll help you out. press[at]ohsheglows[dot]com, thanks! Previous post: Ask Angela: Our go-to vegan sunscreen, freezing vegan taco “meat,” a reader poll, and more! Next post: Crazy Mug Lady: A round-up of my fave mugs!